I just love when I come across those rare books that leaving you feeling so much. They have left you raw, and vulnerable. Every chapter peeling away a layer of you, causing emotions to bubble above the surface. What is hard about these books is you can't muster up the right words to do them justice. You want to gush and rave about it; You want the person oblivious to this novel's beauty to know how simply powerful this book is, but the words that you are conjuring up barely do it any justice at all. Haunting: The book starting off with wonderful character development. Introducing us to Friday and her mother. The spine-tingling family history we learn very early on cursing Friday's family. You are immediately drawn to Friday and her intensity. A free spirit with a beautiful stubbornness to her. Powerful: A thriving character cast gave this book such an energetic element. That thriving character cast sprinkled with Wakefields transendant writing style made for such a powerful reading experience. I love how the author delivered this book exactly as it should be; raw and unsweetened. It's hard, and some moments painful. There are moments that you will cringe and others where a box of Kleenex is quickly being emptied. And I loved how there was a hint of romance. It did not consume the novel, but it definitely paired well with the story! Compelling: Plain and simple! Compelling chararcters. A compelling storyline. Heartbreakingly beautiful. This book will make a lump rise in your throat. I already know this review does not do Friday Never Leaving justice, but I tried my best! Perhaps I could have waited some more time before writing the review but I know that would not have made any difference. I just can't muster up the right words. All I can say is Read it! Go out, get a copy and read it. You will not regret it! Your review is fine. No spoilers and lots of gushing is always a good thing. LOL! 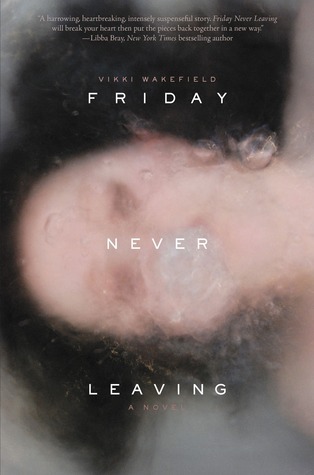 Thanks for drawing more attention to Friday Never Leaving. I haven't seen many reviews or post about it around the blogosphere.